In this project, we will take a multi-level network approach to devise a new dynamic integrative methodology for unraveling regulatory gene networks controlled by multiple regulators. The proposed approach first reconstructs the multi-level regulatory networks from multiple heterogeneous datasets, including expression profile of genes, binding data of regulators and PPI data. To achieve more robust reconstruction results, probabilistic graphical models will be adopted. 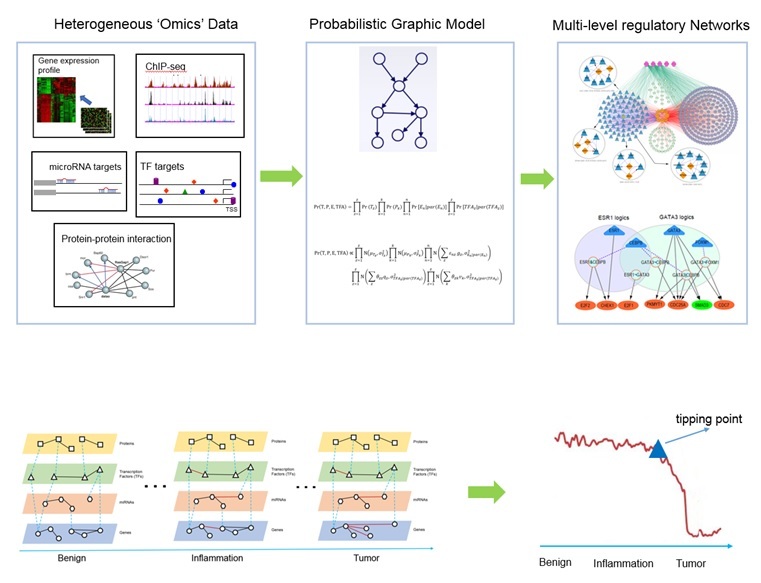 Then, we propose to develop network measures as features for characterizing the structural changes in these regulatory networks at different granularity levels and build machine learning models to identify the networks that are closely related to the irreversible tipping point in inflammation-tumor translation. For evaluation, we will utilize the new model for uncovering gene networks of multiple histone modifications, TFs, miRNAs and PPIs in subgroups with inflammation and tumor status. Through experimental validation, we will try to identify candidate marker genes targeting cell signaling pathways associated with inflammation-induced tumorigenesis. To conduct biological experiments for validating our findings of potential networks associated with the tipping points. This project is supported by the Hong Kong Baptist University Research Committee under the Interdisciplinary Research Clusters Matching Scheme (IRCs). For further information on this research topic, please contact Dr. William K. CHEUNG or Prof. Aiping LYU.